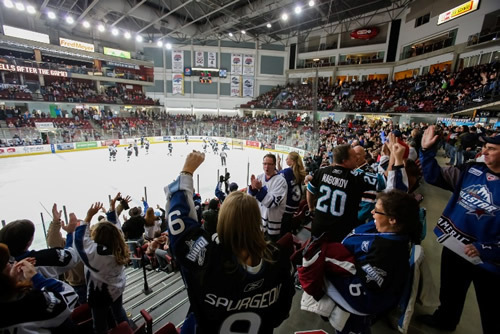 John Mulhern with his weekly update on the Idaho Steelheads. 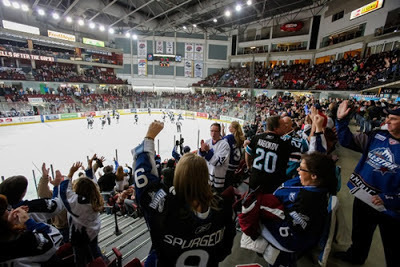 To hear a little bit more about this past weekend, checkout twosportsnuts.podbean.com as Jerome Shell III and John talk a little more in depth about this past weekend of Steelheads hockey as well as thoughts on other sports. After last week’s midnight game in Las Vegas, the Idaho Steelheads had 3 days off for the first time in two weeks. The Steelheads returned to the ice this past Friday to start a 9 game home stand against the San Francisco Bulls (Worchester Sharks). The Bulls came into the two game set with a 2-2 record against the Steelheads including a 6-3 victory back on Wednesday February 13th. After an uneventful start to the game, the Steelheads were able to get on the board as Ben Ondrus found newly assigned (Toronto Marlies) Brad Ross, who made a great move on goaltender Thomas Heemskerk and flipped the puck over his glove hand for the 1-0 lead. Then with just over 30 seconds left in the first, Patrick Cullity picked his spot and snuck the puck past Heemskerk for a 2-0 lead. Heemskerk would not return for the start of the second period. The Steelheads power play would strike again in the 2nd period as this time Ondrus would get the goal to make a 3-0 lead. The last goal of the game came at the 7:48 mark of the 2nd as Tyler Gron got his 11th of the season to cap the scoring at 4-0. Josh Robinson earned his 2nd shutout (first career at home) stopping all 26 shots sent in his direction, including 14 in the final period. Idaho was 2-4 on the power play and a perfect 4-4 on the penalty kill. Tristan King was re-assigned to the Bulls this week (see previous update) and after being nearly invisible during his first game with the Bulls on Friday, he made sure to leave his mark on Boise one more time before he left. King would get a goal and an assist, to go with the clinching shootout goal as the Bulls sent the Steelheads to a shootout loss. Mike Towns would open the scoring with under a minute to go in the first period as the Steelheads did take a 1-0 lead after one. In the second period, the Bulls would tie the game up just 3:21 into the period on Simon Danis-Pepin’s first goal as a Bull. The two teams would split goals the rest of the period as Tyler Gron gave the Steelheads a 2-1 lead only to have Bryan Cameron tie the game once again for the Bulls. The game headed into the 3rd period tied at 2. In the third Tristan King would strike for the Bulls to give them a 3-2 lead 10:59 into the period. It looked to be the game winner, until Gron would get his second of the game to tie the game at 18:06 of the third on a nice move past the Bulls defense and an even better shot. San Francisco had the only 2 shots in the overtime period and all three of their players scored in the shootout as the Steelheads were once again shutout in the skills competition. This past weekend is a mirror image to the 2 game set these two teams had played last week. The Steelheads once again come out on top in the first game looking in control for the majority of the night, however, the Steelheads at points on Saturday looked a bit out of sorts and almost just going through the motions at times. Josh Robinson: Went 1-1 this past weekend, allowing 3 goals on 63 shots. Will be the number goaltender for the foreseeable future with Beskorowany in the AHL. Austin Smith: Just re-assigned by Texas earlier this week. Should be in the lineup for Wednesday night’s game. He comes back to Idaho having played 23 games scoring 19 goals and 11 assists good for 30 points and immediately becomes the teams active leading goal scorer. Matt Case: Normally would put him here since he got a look with Texas last year and at camp this year, but he has been loaned out to the Manchester Monarchs. He has 6 goals and 29 assists for 35 points and has a plus-31 rating this year with the Steelheads.